The start of the year is a time for goal setting and resolutions. Lots of the resolutions I’ve seen people sharing this year are about reducing things. Reducing waistlines is always a pretty common January theme but this year, after the startling revelations about the impact of plastic on our planet and global temperature rises, more and more people are focusing on reducing plastic, energy and resources. As a result of these themes, I’ve seen lots of people switching to bamboo toilet paper, going ‘plastic free’ and decluttering like crazy to try and support their goals of reducing their negative impact on our beautiful planet. 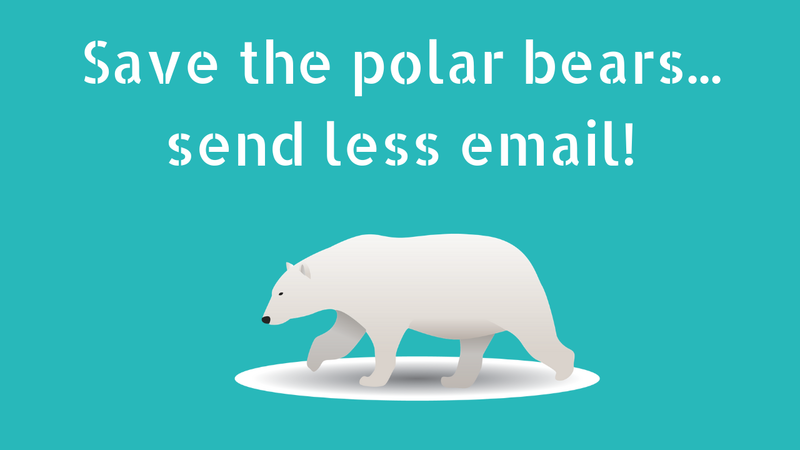 But did you know that your emails could be directly impacting polar bears? On the face of it, email feels like a very environmentally friendly way to communicate. Compared with the paper, pens and ink required to write a letter, fuel and human resource as well as huge sorting machines to get it to the right area and then recycling at the other end, an email seems positively brilliant. The problem is that instead of sending one or two letters a day we are sending hundreds of emails. And each email has a carbon footprint. If you think about an email, while much easier than a letter, there are still quite a lot of resources required. Firstly there is a computer or phone using energy to facilitate the creation of the email, then there is the sending of the email to a central server to be sent out to the recipient/s and also some energy used to read the email as the recipient. In Mike Berners-Lee’s book How Bad Are Bananas? he talks through the carbon impact of a huge range of things that we do (from having a war to sending a text message) and he covers email in quite some detail. Over a year, for the average email user, this would add up to an extra 136kg of emissions being added to your carbon footprint, or the equivalent of “driving 200 miles in an average car”. Nuts eh? As well as the sending and receiving, storing emails also has an environmental impact. Servers (the giant computers that are never switched off) are required to store your old emails on and the more space you take up the more energy you are using. If I’m honest I probably only need about 30% of my carefully archived emails. Which means that 70% of the space I’m using on servers could be cleared up. If we all did this then huge numbers of servers could be switched off, meaning we no longer needed to power them, or the carefully controlled environments they sit in with giant air conditioning units, humidity controls and security systems. While I’ve always been a big advocate of a clear inbox, thinking about the wider impact makes an even more compelling argument for getting on top of it. A clear inbox and the practice of not storing lots of unnecessary emails can have a much greater impact than just keeping your stress levels down. – Don’t send unnecessary emails. – Don’t keep emails any longer than you need to. This one is tricky as storage has become cheaper and we tend not to have to delete emails because of full inboxes anymore but every email stored needs energy for the server it is on to be kept running. – Unsubscribe from email newsletters you don’t want. Think of all the emails that you delete before you ever read them. Unsubscribe from these instead, knowing that this will all add up to make a tiny difference to the world!